Heat oil in a skillet. Peel the potatoes and chop into bite size pieces. When the oil is hot, add the cumin seeds and coriander seeds. Brown them and until they start to pop (literally) then add the potatoes. Put the lid on but don’t cover the skillet all the way so the potatoes “steam cook.” Cut the cauliflower into bite size pieces keeping in mind that the florets have a tendency to break apart. I usually hack the stem off, peel the green leaves off the bottom and then use a knife to cut the florets from the root. When the potatoes feel tender but not fully cooked, add the cauliflower and put the lid back on. Continue cooking, stirring periodically, until the cauliflower looks cooked through. If I’m not serving this right away, then I turn the heat off a few minutes early and leave the aloo gobi sitting on the stove with the lid on and the heat/steam cooks it the rest of the way. A friend has asked that I include cook times (and notify her of my 15 minutes and under dishes!) – I think this probably took about 30-40 minutes all in to make, and the prep is fairly minimum but I’ll try to note the time down more accurately in the future. I am thinking about making this dish, but have cumin powder not seeds, will that work? Hey Keri, that should work fine. They are pretty interchangeable. I would use about 1 tspn – 1 1/2 tspns of the powder in place of the cumin seeds. 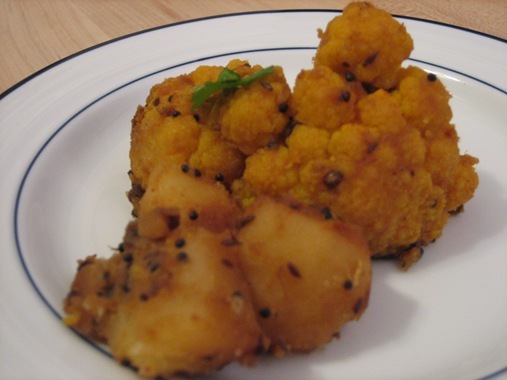 Aloo Gobi is one of my favorite dishes! I love that you’ve shared this quick version. Looking forward to checking out more of your posts in the future! Thanks Erin. You can also add peas and/or carrots to dry aloo gobi for a variation. Add them right before the cauliflower. Looks good – but where does the tomato fit into the recipe? Amy, thanks for pointing this out. I’ve corrected the recipe by deleting the tomato. You can also get purple cauliflower and green cauliflower. I believe the green is crossed with broccoli – not only is it green but the florets become spikier, like little spiral pyramids. (If you look close, you can see a hint of this spiral structure in regular cauliflower as well.) They all taste about the same, but the different colors can be fun and decorative. 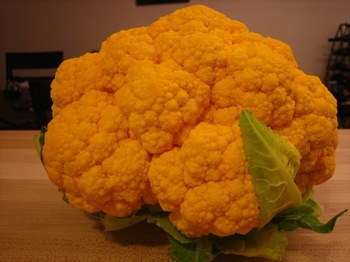 The cauliflower stem, like that of broccoli, is edible. Cut off the leaves, and the bottom 1/2 inch or so which has dried out from being in the store. The skin of the stem is softer than that of broccoli, so no need to peel it – just cut in thin round slices, like slicing a carrot. The crunchy rounds remind me of water chestnuts. The stem slices need a little more cooking than the florets – in this recipe, I would add them 5-10 minutes before the florets.